YAY! for reading/blogging picking up. and thanks for you mini on Practical Magic! I like the movie and you just made me want to pick up the book! Oh, spring is definitely in the air here in Mexico City, we are hitting the high seventies every day. The weather has definitely been weird. Snow on April 1st? I couldn't believe my eyes looking out the windows. Sigh. I love Sandra Bullock so I'm always on the lookout for more of her movies. Thanks for bringing Practical Magic to my attention. I'm going to check it out soon as I can! I thought I read a lot of books this month but looking at my list, I only read 2 more books than you. And of the 13 books, 12 of them are really enjoyable! That's a record for me, enjoying so many books in one month. From the list, there's Cynthia Eden, Julie James, Lorelei James, Allison Brennan, Robb, and Shelly Laurenston. All quite wonderful stories and authors. Yeah for the Thurmans! She has got to be one of my favorite authors. Can't get enough of her. My favorite for March was Julie James' A Lot Like Love. Alex, I got 'stuck' watching Practical Magic, the movie, for the hundredth time, lol... and decided to look up the writer. I bought the book right there and then and just read it. It is different from the movie, but as in most cases when it comes to movies and books, I thought the book has better characterization and there's more depth to the story. I hope you enjoy it. Lucky you! It sounds as if you're getting beautiful weather in Mexico City. Enjoy! Tabitha, that April 1st felt like Mother Nature was playing an April Fool's joke on all of us, didn't it? It was bizarre. 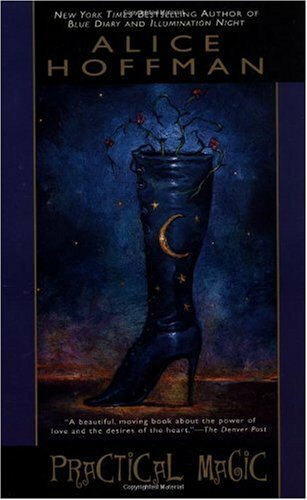 I hope you do check out Practical Magic, I'm actually going to check out other books by Alice Hoffman since I enjoyed her writing. Leslie, spring in the desert is a gamble. I've been in that area during this time of year and it's crazy! We just had winter weather throughout March. I never put away my winter boots or my heavy coat. :( Still have the stuff hanging around. Loving both Thurman series. I was surprised at how much I enjoyed Chimera, it was such a wonderful combination of characterization, action and futuristic details. Loved the bonding between the guys and can't wait for the 2nd book. I STILL have A Lot Like Love by James in my TBR and will read it in April... I know I will... LOL! Woohoo, Hils!! A great month :) is it going to continue now that your boss is back? LOL, two Rob Thurman for you this month and good ones at that, that's great :) She's great, right? Can't wait to see your review of My Lord Scandal! Nath, I hope so! 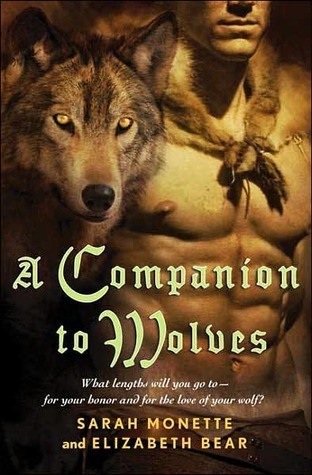 LOL on the cover of A Companion to Wolves, I'm glad it didn't bother me. This is my first Monette book and it's a collaboration with Bear, so I'm not sure who wrote what? But I liked the combination of both. Loved the Thurman books! I'm really enjoying her both series so far, so yeah! RE: Snow? We are known for getting snow in March, but April? Nope. Hope your Easter is snow free! That's too bad that Prospero Light was a DNF for you. I read February's pick in March and thought that my libraries didn't have March's pick, so I skipped it... only to learn last week that they DID have it, but didn't have April's pick... which it turns out I'll have to skip. Sheesh. I plan on reading May's pick, though. Christine, I love Practical Magic the movie too. I always watch it when it comes up -- can't help it. The book has all the ingredients in the movie, but there's more depth to the characters and situations and the girls are teenagers. They contribute lots more to the story. I think you'd enjoy the book.